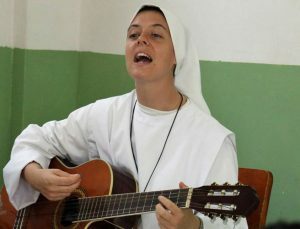 “It is not the way things should be that parents bury their children,” parish priest Fr Eamon Graham told mourners at the funeral of Sr Clare Crockett, the Irish nun who was killed in the earthquake in Ecuador. The 33 year old Derry native died along with five postulants of the Servant Sisters of the Home of the Mother when a stairwell collapsed on 17 April as they were attempting to escape their school building in Playa Prieta. They were among the 520 people to lose their lives in the tragedy. In his homily, parish priest Fr Eamon Graham told Sr Clare’s family, relatives and friends who gathered in the Long Tower church that her death had thrown up many questions about God and his ways for all of them. “One thing that has emerged” Fr Graham noted, was the insight they had gained into Sr Clare’s life and motivation. He said she was “a striking example of Derry womanhood”. Bishop Donal McKeown of Derry, the retired bishop of Derry, Dr Edward Daly, and Bishop Kevin Doran of Elphin presided at the funeral which was concelebrated by ten priests. The Presbyterian minister, Rev David Lattimer also joined the clergy, while the leader of the SDLP, Colm Eastwood and Northern Ireland’s Deputy First Minister, Martin McGuinness also attended the funeral. The Gospel chosen for the Mass was from St John and was chosen because it was one of Sr Clare’s favourites. It recounts Jesus relating how there are many rooms in God’s house. Fr Graham concluded his homily by saying he liked to think that Clare is looking down from a window of her father’s house. Thomas Gallagher, who knew Sr Clare before she entered the order, and had travelled with her to Santander in Spain where she was first introduced to the Servant Sisters of the Home of the Mother told CatholicIreland.net that when her body was found in the rubble of the earthquake it was discovered that Sr Clare had been killed as she was opening the door to usher out those she was with in the school building in Playa Prieta. In his tribute to Sr Clare at the end of Mass on Monday, Bishop Donal McKeown said the young nun had, like Jesus, died young. He said that “because of Jesus we believe that a life given in loving sacrifice is never wasted”. The Bishop of Derry said her death was “a huge cross” for Sr Clare’s family. But Dr McKeown stressed that her ministry did not die with her. Sr Clare had seen heroism and idealism alongside loss and betrayal in the city where she grew up.